For use with a shaving brush only - rich in glycerin, natural botanicals and essential oils for scent. A moisturizing lather with lots of glide that rinses clean for a close comfortable shave. This natural shaving cream contains no colorants, synthetic fragrances or other harsh ingredients and is formulated for sensitive skin. Pure essential oils are used for aroma and skin conditioning benefits. A naturally thin, pearlescent formula for use with a brush that comes in a handy convenience pump bottle and available in three sizes - 2, 4, and 8 ounce with pump top. Shake before use as separation can occur due to natural ingredients. Makes lots of lather and made in the USA. It's all about the water - too much and you get bubble water, too little and you get dry film and insufficient lather. Generally speaking, it is not a thick interfering foam like what is found in store brand shaving canisters, but rather a layer that allows the razor to slide along the face without too much foam to get in the way of a close shave. You can control the amount of lather created by how much water remains in the brush, how much soap or cream is applied to the bristles and the scrubbing motion used on the shaving area. Experiment and you will find what works best for you. 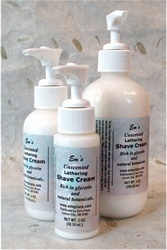 Videos: Creating Lather with Shaving Cream or Adding Essential Oil to Unscented Shaving Cream. The video demonstration shows how easy it is to fill a .5 ounce malibu travel tube using one of our pump products. For the 4 oz. bottle of shaving cream used in this video you get about 45 pumps into a .5 oz. malibu tube. That is more than enough for a week or two of shaves depending upon how much you use. Our shaving cream is a thinner consistency and can also be applied directly to the bristle tips of a shaving brush for face lathering - fast and easy! Intended for use with products that have body to them - for example the shaving cream or moisture balm. Not intended for oils and liquids unless you use a lined cap to prevent leaks. My last use and review of Em's shaving cream was December 2011. After using over 40 different shaving soaps from other venders over the last 6 years, decided to re-experience using Em's shaving cream. Just completed an enjoyable shave using the Minty Menthol aroma shaving cream. It's no surprise that Em continues to provide one of the very best shaving creams on the market. I really appreciate how quickly I can develop extremely thick luxurious lather that provides the extra protection that I need. The calming menthol aroma was a super experience that allows the supporting aromas of Rosemary, Peppermint, Spearmint and Frankincense to also be experienced. Finally, new customers need to know that Em has not changed her price on her shaving creams over the last 6 years!!! That's incredible customer service!!! The shave cream lathers up nicely for 3 passes with an inch on top of wet brush. Each pass lightly dip brush tips into water to regenerate layers of lather. My DE glides across face resulting in a very smooth shave. There are no runs cuts or errors (baseball season in full stride) and face feels very smooth. The smell is not overwhelming and dissapates upon rinsing. Add a touch of same scent After Shave Balm and face is in for a very smooth finish. I may add this collection to my rotation. Em's Bay Rum Shaving Cream Rules! I have found that Em's bay rum scent is very special after using her Bay Rum shaving soap puck. I really like using "Em's super lathering" combination that involves mixing the same scent of Em's shaving soap plus cream. I think that that "Em's super lathering soap/cream "combination makes the very best thickness and lubrication for shaving. For me, Em's bay rum scent just brings the Zen of shaving to a higher level of personal satisfaction with DE shaving. Em's Shave Cream has worked extremely well. Nice rich cream, as good or better than any I've ever used. A bottle lasts a long time so it's a good value. All natural ingredients and you can feel good about ordering from a local American company.